Whew it's been a crazy week! I haven't had much crafty time, but I never shared this card I made for my son's 5th birthday so I'll share it with you now! I used sketch SC19 for this on SCS. Image is Stamping Bella colored in with Bic Mark It Markers, highlighted with Stickles. Papers are SU Ruby Red and Garden Green and DCWV. Dots are Martha Stewart. The blue background is embossed with a Cuttlebug embossing folder and distredded with sandpaper. Love the monsters!! They're so stinkin' cute!!!! Oh my gosh girl, I can not even tell you how much I love this card. So precious, I love seeing different boy cards. Love the image! How "monstrously" cute! These are just so darlin' and I love the colors and the embossing. Those are some friendly looking monsters! 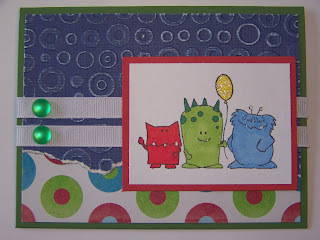 I love the bright colors and the monsters are just too cute! Awww, how cute is that!!! I love the DP, it fits this darling image so perfectly!! how flippin cute is THAT???? Love all the monsters!! I have the Bic Mark Its too- they are good markers. I love your card. Ahhh...I bet he loved thos little monsters!! Great colors too! This is so stinkin' cute Colleen! I love how you're growing so much as an artist. How cute! Fabulous card Colleen! Soooooo cute! Love the torn paper edge!! Love it, especially how you made it look like the monsters took a bite of the dp. Very creative.